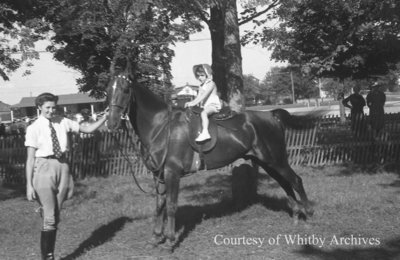 A black and white negative an unidentified child sitting on a horse at a horse show on August 16, 1939 in Whitby, Ontario. In this view an unidentified woman wearing riding attire is holding on to the horse. The horse show was held on the property of the Whitby Lawn Bowling and Tennis Club. Hand written on the negative envelope is the name Corb Stiner. Horse Show, August 16, 1939, Marjorie Ruddy. Whitby Archives A2013_040_640C.